Did you know that Facebook can extract information from a photo you uploaded on it? yes, it can and in fact it does. 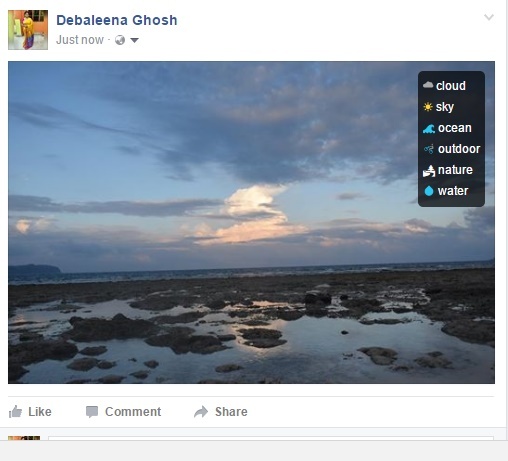 You can find out what information Facebook finds out from a picture you uploaded in the form of tags. There is a Chrome extension for that. It’s called Show Facebook Computer Vision Tags. You can see the tags that Facebook adds to every image that you upload. Facebook deploys deep learning and detects information from images. It automatically adds alt tags to the images you upload. A certain number of tags are created based on the content of your image. Facebook create labels for your images using a Deep ConvNet built by Facebook’s FAIR team. the feature is not harmful. It has several advantages. It improves accessibility for blind users who depend on screen readers. It provides related posts by the content you watch or like. But users must know which information is being extracted. This is a very simple Chrome Extension that makes it easy to see the tags that Facebook is automatically applying to you and your friends’ photos. Once you install it, all the photos you see on your Facebook timeline will automatically be overlaid with their tags. 2. Now sign in again to Facebook. 3. Now upload a photo or just scroll through your NewsFeed. You will find the tags.